Please take a look at the ALL NEW TimothyPatrickMcMahon.com! I’ve been spending more and more time on Tumblr. And by time, I also mean I am posting more and more stuff on Tumblr. 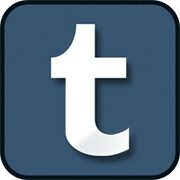 Tumblr is becoming my “real” site, more then this page is. So, I’m debating weather or not I need to redirect TimothyPatrickMcMahon.com over to my Tumblr site for good. I would love to, but, I don’t want to lose all the junk I’ve already posted here. However, i get much more traffic over on Tumblr then I do here. I have been double posting, putting the same stuff up on both sites, but I’m kinda getting sick of doing that. Anyway, just thinking out loud. I’ll make up my mind soon. In the meantime, please go visit TimothyPatrickMcMahon.tumblr.com. Eleven days ago, I listed nine boring facts about my recent days. Nine? Who makes a list of nine things? That’s just stupid. I recently installed a new flapper in my toilet. Yup, I’m practically a plumber now. But not just any kind of plumber. I’m a plumber who is saving the Earth! You see, when I changed the flapper in the toilet, I also inserted a new-fangled device into it, and then I changed the handle on the outside of the toilet to a button. Two buttons to be exact. The type where you press button number one if you did number one, and button number two if you made a number two. Supposedly, when pressing button number one, I use 70% less water. Over the course of a year, for a family of four, that would be enough water to stack water bottles 45 miles high! -Or something like that. I can’t quite remember what the box said, but it had a neat graphic of water bottles stretching into space. Another thing about the box that the device came in; it proudly proclaimed that this hardware was designed by a fourth generation American plumber. This is so awesomely American to me. Here, you have a trade, passed down from generation to generation… Here, you have a person who, with the wisdom of their family behind them, tinkers to make things better… Here, you have someone who saw a problem, and found a way to make it better… To me, it’s such a storybook American tale of family, ingenuity, and entrepreneurial-ship; I love it! But of course, the device is made in China, which is also to typically American as well. Anyway, there you go, another boring fact about recent life. WordPress just screwed me over for the second time in a month. After writing a long post about my adventures in Boston last night, WP ate my post before I could click “publish”! It did this after my ROFLcon weekend too. AAARRRGGHHH!!! Frustration! I should have learned after the first time. But I didn’t. Well, I have now. From now on, I’ll write up my stuff in a seperate document before posting. As for last night… Here’s this to hold you over until I can get around to re-writing about the night. I’m sorry Facebook, it’s not me, it’s you. We need to go our separate ways. I’ve found someone new. Her name is Tumblr. She’s younger, slimmer, and way cooler. She doesn’t have the crazy streak that I all too often see in you, and none of the extra “bloat” that you carry around. She’s prettier to look at too. Anyway, I’ll still post to you from time to, remotely. But, I can’t bring myself to spend so much time with you each day. You’re dragging me down. See ya around. Wow, is it that time already? Time for another ROFLcon? Cool! Cuz I love me some ROFLcon!!! 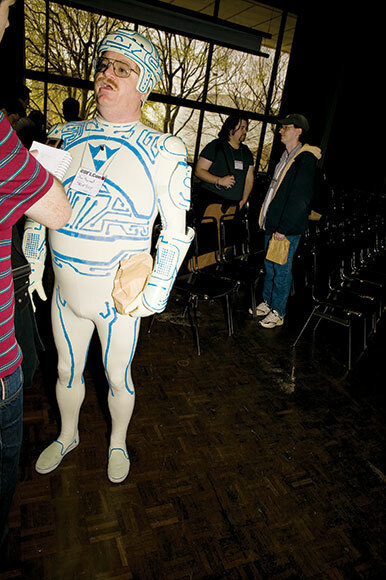 I went to the first ROFLcon back in 2008, and it was great. Except for the fact that I had the flu and should have been in bed. BUT, I wasn’t going to miss the event for anything. Instead, I loaded up on medications, water and trudged through the weekend. Look, here is a picture of me that was in WIRED, feeling puffy, light headed and a bit out of sorts. I'm the Ickabod Crane stand-in in the back. I went with my buddy Roe, also seen in the photo above (not the one in spandex). We had a great time, but we knew that when ROFLcon II came around, we needed to have a better time! But how? Well, we wanted to stand a bit closer to the ROFLcon spotlight. But, neither of us had anything that would deem us worthy of being on a panel, we didn’t have an audience, we didn’t have cyber-fame, we were not innovators or creators, we were not Internet Superstars. At first it was jut a joke, but we decided to do it. We have no goal other than to get people to stop and say hello. Simple as that. We want this weekend to be a social adventure were we meet new and interesting people, have conversations with intelligent strangers, and, as an ego stroke, we want people to approach us and ask to have their pictures taken with us. (Yes, I’ll admit I can be just that shallow!) Simple as that. This site isn’t much, just a place I share stuff I’ve found other places. I’m sure these links, photos and videos are not everyone’s cup of tea, but they made me lol, and so I’ve reposted them here. I keep telling myself I need to do something “original” with this site, but I’ve yet to come up with an idea. Stop by again in the future, look for me elsewhere online, and let’s be internet friends! I’ve never sent or received a video message on Facebook. Do any of you ever uses this feature? Just curious.